Blockchain is a distributed database that first came to prominence as the backbone of Bitcoin. Blockchain is a public ledger of transactions that is composed of two parts: Peer-to-peer network, and a decentralized, distributed database. A P2P network is an architecture of computers or networks that shares tasks, work, or files between peers. Peers are partners in the network with equal privileges and powers in the environment. In a P2P network, each computer or user is called a “node” and collectively they comprise a P2P network of nodes. An easy way to think about P2P networking and nodes is through early file sharing services like Napster. Users could log in to Napster and share audio files stored on their computers. In turn, they would have access to audio files available on other nodes in the P2P network. If/when there are duplicate copies of audio files available, the P2P network would split up and share these files across the nodes. If you wanted to download a specific audio file, the P2P network would look across the nodes, and pull in parts of that audio file from the various nodes that had it..and compile one copy of the audio file for you. The P2P network in Blockchain consists of a series of computers and servers that each act as a node in the network. The blue dots below represent nodes in the P2P network. When a new message enters the network, the information in that message is immediately propagated between all of the nodes of the P2P network. They all immediately get the same information. The information is usually encrypted and private. There is no way to know identities of who added or removed information to the network. In the graphic below, the red lines represent new information entering, and spreading throughout the network. When new information enters the network, this information is then propagated, or distributed across the nodes in the network. The figure below represents this by showing new information in yellow spreading across the nodes in the network. The entire network is decentralized, which means that there is no one point of failure in the system. If a node leaves the network, the other nodes already have exact copies of all of the information shared. If a new node enters the network, the initial nodes immediately create copies of their information on the new member of the network. The figure below details the network propagating information to the new node. The second element of the blockchain is the database of transactions. This database is the “information”was we discussed sharing in the images above detailing the P2P network. 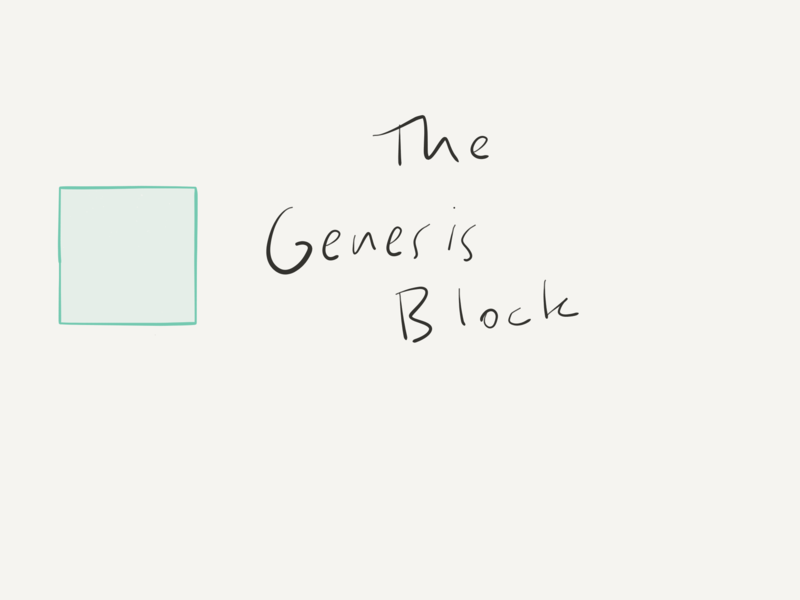 The first element in the database is called the genesis block. The genesis block is hardcoded into the software and exists as an empty state, that is to say that it has no real value other than indicating the beginning. The genesis block may contain information about the rules or guidelines for the remaining database. The genesis block is block zero, or the first block. After that, the database is formed by a series of blocks that link together to form a chain. This is where we get the naming of the blockchain technology. The blocks in the chain each contain information or transactions. As you add transactions, this information is stacked in the block according to the time it was presented. The transactions contain anonymized information about who added or removed value in the transaction, as well as date and time. This combination of information and time creates a ledger documenting value or other resources in the database. After the transactions have been stacked in the block, a signature or “hash” is added to the bottom of the block. The hash links to the previous block in the chain. These hashes form the links between the chains. The hashes link all of the way back to the genesis block. The hash includes the number of the block, and the number of the next block in the chain. The hash also includes the date and time it was signed, as well as how many transactions are included in the block. The signature, or hash, shows up as a cryptographic, or encrypted hexadecimal key. At this point, new blocks and transactions are added to the chain. Each block contains a series of transactions or comments. These transactions are followed by a hash in the block. As a reminder, each hash serves as a link to the other blocks in the chain, and indicates their order. Blockchain is a distributed database that maintains an expanding ledger of data and records. This ledger is encrypted and protects against tampering, revision, and deletion. The time-stamped blocks that make up the blockchain contain hashes that link that indicate important information in the database. The mixture of transactions, blocks, and decentralization of data in the ledger provides tremendous opportunities for many fields. For a concise video overview of the potential of blockchain and the connections between these elements, please review the following video. As we continue to investigate the intersection between blockchain technologies and education, there will many possibilities that present themselves. I think it’s important that we fully understand the technology that forms the backbone of this new ledger. Why in the world would you want to develop a Massive Open, Online Course (MOOC)? ← Why in the world would you want to develop a Massive Open, Online Course (MOOC)? 11 Comments → What is Blockchain? Great Article! Very well explained on the blockchain. I really appreciate the blog it looks very Interesting and Informative. The blockchain is a great technology, Please keep sharing.